Getting the discussion rolling in my teen book club can be tough. Especially when the teens don’t know each other. 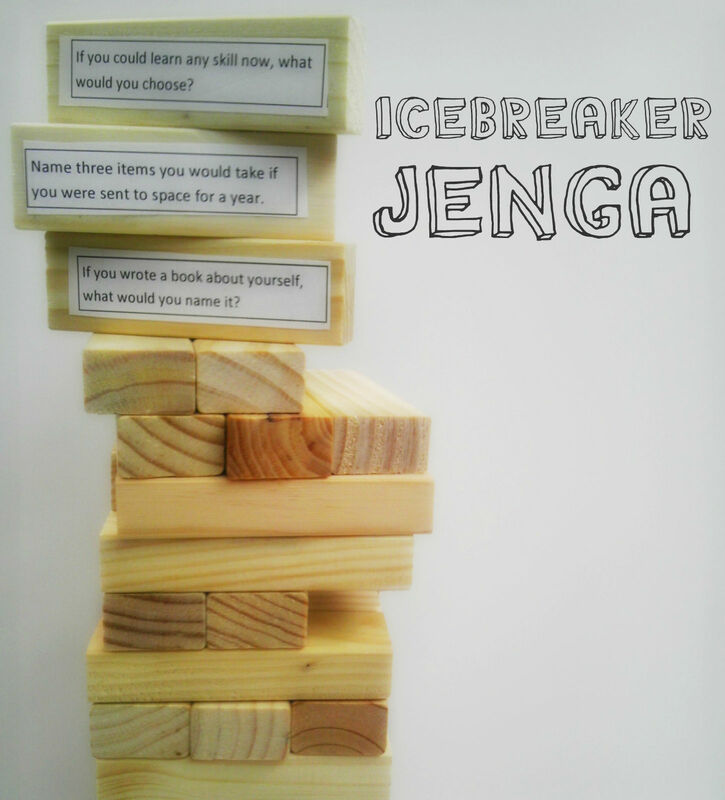 To get things started I made an icebreaker version of Jenga (I saw this on Pinterest somewhere, but can’t find the pin now). It’s very simple to make. I just got a generic Jenga game from Dollar General, typed up some icebreaker questions, and taped them to the game pieces. It’s played like regular Jenga, but you have to answer the question on whatever piece you pull. The teens went crazy over this game and it really helped everyone get comfortable with each other before discussing the book. They wanted to play it at the start of every meeting. It helps if you have a mix of silly questions and standard get-to-know-you questions. Note: The chess club teens also flipped out over Book Lover’s Jenga, which is similar but is actually an official Jenga game and dedicated to bookish questions. One of them even asked if he could take it home with him. Here’s the latest round of trivia questions I put together for our teen trivia program. This month we have famous mustaches and West (Best) Virginia fact fun. Answers can be found here. As always, feel free to use these for your own library programs. 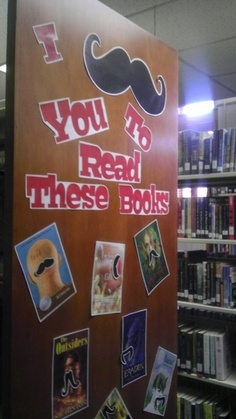 This Teen Librarian Toolbox post inspired my first library display last year (see photo) and now it is inspiring my first ever teen winter reading program. Our teens requested that we host a winter reading program this year, they also requested that we use BINGO cards (I made BINGO cards for summer reading and they loved them). 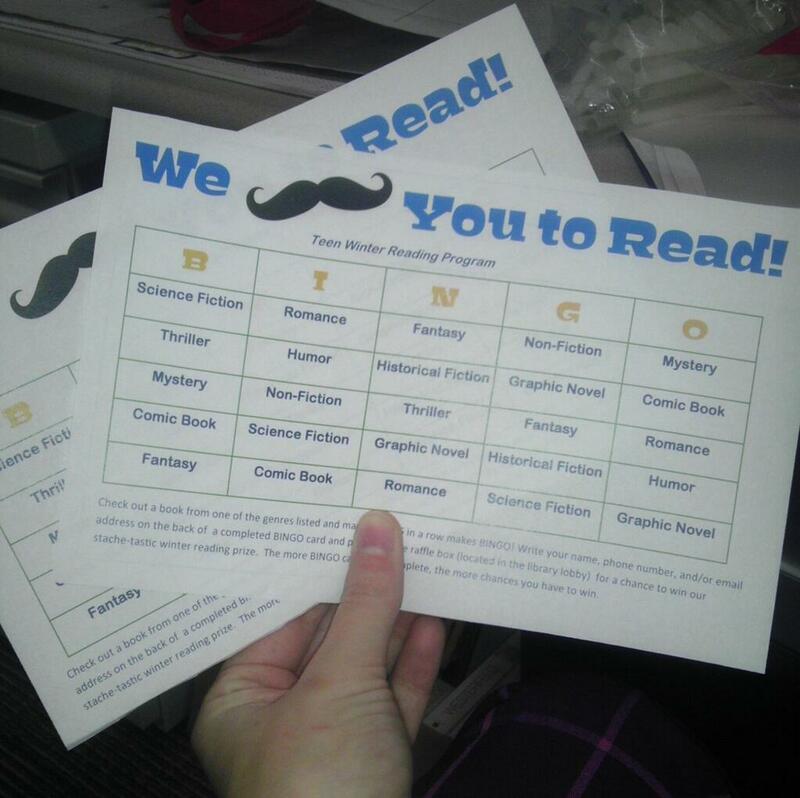 So, I went with the theme “We Mustache You to Read” and made a simple, bookish BINGO card. Basically they check off each type of book they read to make a BINGO, completed cards get entered into a raffle. I’ll also make a recommended reading list, in case they need help finding titles. I’m not sure what I’m going to give out as a prize yet. At a previous trivia event, the prize was a mustache tote and the teens loved that. I’ll probably get another one of those and stuff it with books and delightfully geeky things. I wanted to keep the program passive, so we aren’t having any big activities at the library outside of our regular clubs. The winter weather in West Virginia is just too unpredictable to expect teens to make it to events. I’m just glad to know that they enjoy the programs I plan and are requesting more. Unfortunately, since my official position requires most of my attention, I can’t always give them the amount of programs they want. Here is a PDF of the BINGO card. Feel free to swipe it for your own use. ‘Tis the season for online learning, especially in the library field! December’s calendar is brimming with exciting and free learning opportunities for librarians looking for professional development. Check out this list of 35 gratis webinars, just in time for the holidays! Read: 35 Free Live Webinars for Librarians in December | Ellyssa Kroski | OEDB.org. 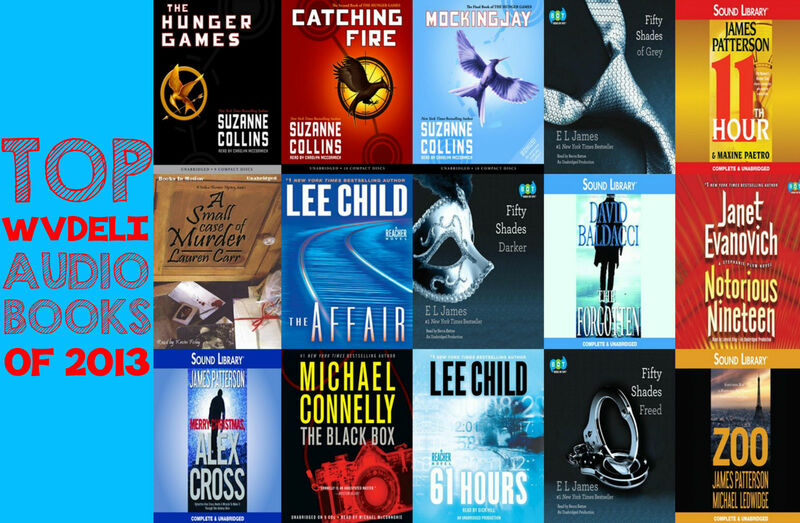 To complement yesterday’s top ebook graphic, I created a graphic of our most downloaded audiobooks. 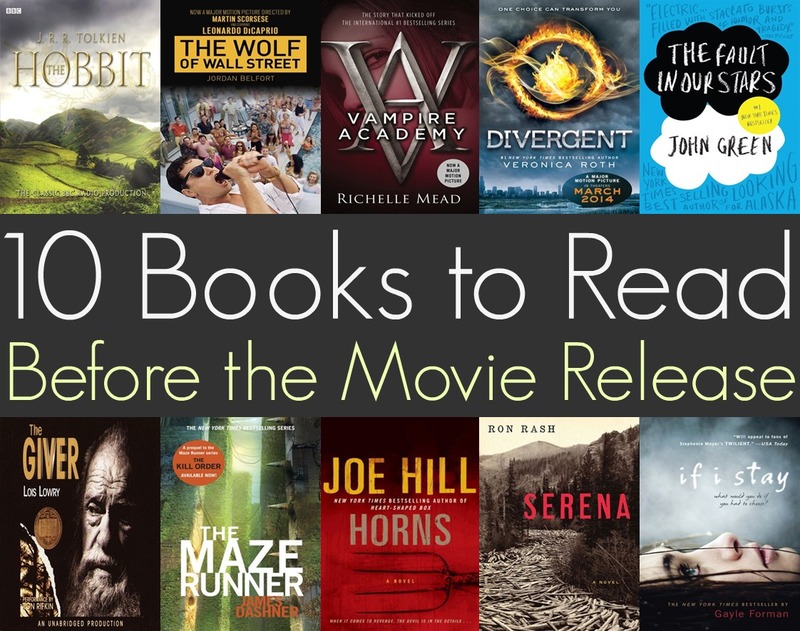 What sticks out to me is that this list includes a lot of titles that we couldn’t purchase in ebook format due to publisher restrictions. 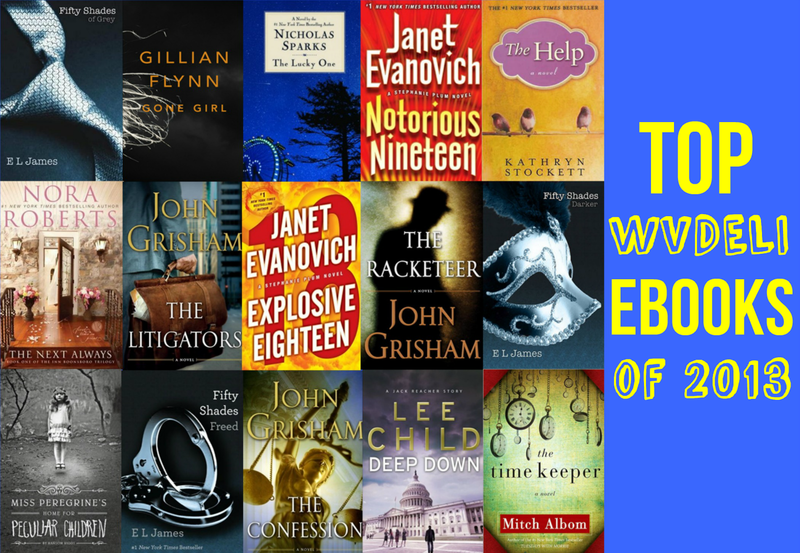 Our OverDrive-powered digital library consortium recently decided to create a Facebook page. This gal gets to moderate it (which is fine by me, I love Facebooking on behalf of libraries). Since the end of the year is almost here (hurray! ), I ran a quick report in OverDrive’s marketplace to find what our patrons checked out the most in 2013. Then I used Publisher (since we don’t have Photoshop) to create this infographic so I could share it with all of our internet friends. The response is good so far (it was even retweeted by OverDrive). No surprise, Fifty Shades of Grey was checked out more than any other ebook this year. To see the list, click here.